Happy Kitchen Sink Stamps Monday, thanks for stopping by! Today I'm sharing a cute Valentine using Kitchen Sink Stamps Multi Step 'Lil Elephant, Multi Step Sweetheart Roses, Ready 4 Any Holiday and Multi Step Bunch 'O Balloons sets. Hi Lisa, such an adorable, well designed card. Congratulations on being published too! I am such an elephant fan, just don't see many as beautiful as this one, at least not on cards anyway LOL! This card is precious - I'm wild 4 it :)!! I love this elephant with the balloon! He is so cute! 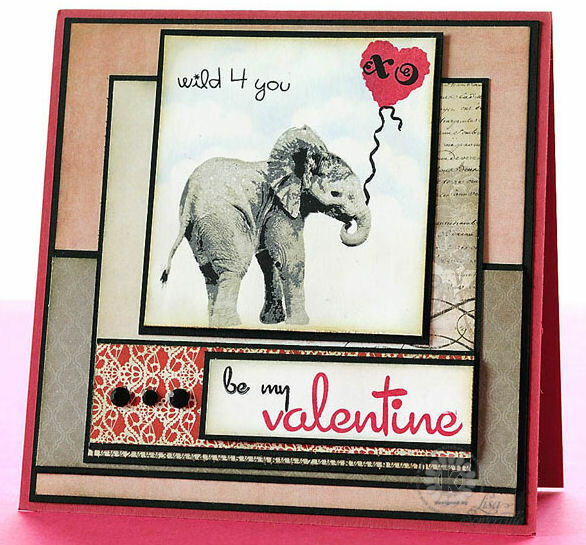 I have this elephant and have never thought to use it as a Valentine. Thanks for the inspiration.